The retreat is focussed on improving your wellbeing through yoga and ayurveda in a completely natural environment. You will have daily yoga, meditation and ayurvedic treatments in addition to healthy fresh nutritous food and ayurvedic herbal medicines. You will be cared for by our team of experienced yoga teachers, Ayurvedic doctors and therapists, who will all work with you to help achieve optimum results during your stay, leaving feeling lighter in body, mind & spirit. It is a place where life in nature, fresh air, nutrition, and herbal medicines combined with mindfulness techniques of yoga and meditation with personalized service, Plantation Villa offers a haven for guests to relax in and focus on their well-being. The Retreat Centre enjoys fabulous guest reviews and is focused on offering a personalized service to all who stay with us. As an eco-friendly Retreat Centre, we work tirelessly for the sustainment of our environment and the village people. The centre employs local staff and funds numerous village community establishments such as the village temples and schools. The Centre Supports its own charity, The Metta Trust and guests get an opportunity to join in the charity activities. The villa is a colonial home, approximately 150yrs old. It was the house of the village chief - and it now converted to consists of a living room, dinning hall, veranda and open living area all renovated in end 2015/2016. The property consists of the main Villa and the Lodge, each about 2 minutes walking distance from each other. The Lodge is the original house of the first occupier of this colonial treasure. With time, their son built a bigger home to house his expanding family. This is the Villa. The Villa consists of 8 rooms (2 Suite Rooms and 6 Deluxe Rooms) and the Dining Hall, Lounge, Verandahs and Spa. The Lodge consists of 6 Standard rooms and an open Verandah. Both the Villa and the Lodge were renovated in end 2015/2016 and is decorated to contemporary colonial style in keeping with the age of the property and to meet our guest comforts and modern needs. Rooms are beautifully completed with luxury bathrooms. Each guest has an initial consultation on their first day. This consultation gathers a holistic understanding of our guest covering physical ailments, areas for stress for the mind, lifestyle, and wellness objectives or requirements. 14.30 - 16.00: Rest or Join in one of our Afternoon Activities, which includes: Walks in the plantation, activities in the plantation, tree planting, cookery classes, talks with the yoga teacher or doctor etc. 20.30 onwards: Evening discussions with Yoga Teacher, Meditation or Private Reading etc. Ishara is the founder and owner of Plantation Villa. She is a regular meditation practitioner whose practice has changed her life. She has practiced and studied Buddhism and meditation over the last eight years. With an inspiring life story, Ishara helps explore the world of meditation through an explanation of the mind, its nature and habits, to overcome obstacles and allow the inherent sense of fulfilment that we all have to shine forth. Bernardo has been teaching Yoga for over 9 years. He owns his private studio in Brazil. He focuses on Hatha Yoga, with complementary studies on Kundalini, Nidra and Vinyasa Yoga. For the past 3 years he has traveled extensively in Europe and Asia, to learn and teach in different countries, including Greece, India, Sri Lanka, Australia and New Zealand. At the moment he works with Plantation Villa on it's centre in Sri Lanka and guiding their international retreats and workshops. He is also a Vedic Chanting teacher (KYM - India) and a Ayurvedic and Thai masseur. The property is located in a small village called Nehinna, 80 km away from the capital city Colombo. The village is rural and has a traditional community feel. The retreat centre property itself is a 30 acre plantation of rubber, coconut, cinnamon, and black pepper. The villa is surrounded by nature and is a habitat for rare local and migrant birds, butterflies, and a plethora of tropical flora and fauna. We have an open yoga sala where yoga and meditation classes and buddhist poojas take place. We specialize in Ayurveda which is an ancient art of healing the body and mind through nutrition, relaxation, and herbal treatments. We follow a farm to plate policy where majority of the food we serve you come from our own organic gardens. The hotel gardens consist of a paddy field, an organic vegetable / fruit spice and herb garden. Guests are invited to join in the paddy harvesting and fruit / vegetable and spice picking. Cookery demonstrations are offered to those guests who are interested. Sinharajah Natural Rain Forest - the last remaining rain forest in Sri Lanka which is lush and green and hike through this will be an amazing experience. Whale & Dolphin Watching in Mirissa - We work with a company working with whale conservation in Sri Lanka. It is an early morning start but totally worth the experience. Udawalawe National Park (to see Elephants) - we recommend this trip over the trip to Pinnawella Elephant Orphanage, where we have heard mixed reviews about how the animals are treated. This is an opportunity to see elephants in their own natural habitat. Holding the largest population of elephants in sri Lanka, you are almost guaranteed to see elephants here. Kandy Town and Temple of the Tooth - The last kingdom of Sri Lanka still rich in art and culture. Kandy also has the Temple of the Tooth where Buddhas tooth is kept and is one of the most venerated sights in Sri Lanka. Apart from its religious significance, it is also a must see sight to understand the richness of Sri Lankan art and culture. Local turtle hatchery: a turtle conservation project to help save turtles from extinction. You can see and learn about turtles and can have the opportunity to release baby turtles to the sea! This is achieved through a relaxing technique in which warmed oil is poured over a clients forehead for an extended period of time. Shirodhara is traditionally used to calm the nerves, harmonize vata constitutions, restore the nerves, release stored emotions, and purify the mind. In Ayurvedic medicine, it is considered an important tool in the pursuit of higher states of consciousness. Shirodhara has been traditionally shown to help with fatigue, mental exhaustion, anxiety, insomnia, some mental disorders, headache, excessive thinking, nervousness, and many other conditions commonly affecting persons in todays active lifestyle. Body, head, foot, and face massages are administered by our specialist therapists using medicated herbal oils. The oil used and the level of intensity given to different areas of the body is varied according to the guests body type and doshas. Regular oil massages delays the aging process. It loosens the deep seated toxins from joints and tissues and releases them into system, where they are eliminated and helps to nourish, strengthen and lubricate the joints. It makes the joints resilient to wear and tear. Besides this, the accumulated toxins from skin are also released to give healthy and clearer skin. A rejuvenating therapy, massaging the body with hot cotton boluses, made up of a combination of herbal leaves, flowers, and spices. Herbs and massage strokes are chosen according to your dosha. The herbal plants are then warmed and tied into a muslin cloth before being massaged over the body. Pinda Sweda helps to rejuvenate, strengthen, and nourish the body. The body perspires, allowing the heat and herbs to penetrate deep into the skin. The treatment provides deep relaxation, improved blood circulation and increases suppleness, removing joint stiffness and swelling helping to relieve arthritis. - Vashpaswedanam steam bath and inhalation Ayurvedic steam bath is a special treatment in which leaves of medicinal plants are simmered and the body is exposed to the resulting steam. It is good in flushing out impurities from the body, reducing obesity as well as excess fat and in the treatment of skin diseases. The treatment removes skin acne by cleansing and dilating the pores and washing out accumulation. By inhalation of steam, the respiratory system is cleaned and can breathe easily. It helps to slow down aging process and drooping of the skin by stimulating it. 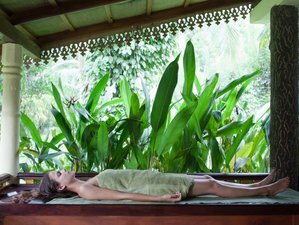 Plantation Villa provides panchakarma treatments which are a therapeutic way of eliminating toxic elements from the body. The body is then treated to balance out the doshas through external therapies using herbal oils and herbal packs and internally through herbal medicine and diet. We do require a minimum 21 night stay to administer Panchakarma because we need to prepare the body (Purva Karma) prior to treatments and then normalise the body afterwards. We are about 1.5 hour drive from the Colombo Airport. The hotel car is available for transfers at the rate of 65 USD for pick up. Plantation Villa suggests you arrive between 7 p.m to 7 a.m to use the airport transfer services. Alternatively one can come by train to Kalutara. Airport: Bandaranaike International Airport Airport transfer available: Bandaranaike International Airport (US$65 per person) Additional charges may apply. You can request this in the next step. Plantation Villa is an eco-friendly retreat hotel offering an exclusive well-being lifestyle and experience through lush nature, ayurveda, yoga and meditation. This retreat is only available until December 20. Only the Full Ayurveda and Weight Loss packages will be available from December 21 to January 9. Please send an inquiry for information about the price cost!